As the mood of crisis that surrounded the Indonesia–Australia spying scandal recedes into the past, debate continues about what lessons Australia should learn from the affair. While the episode certainly provides instruction on how we might handle relations with Indonesia better in future, we should take care not to learn the wrong lessons. The first thing to note is that Australia has friends in Jakarta, the most valuable being those who can criticise Australia frankly  while remaining broadly sympathetic. But a remarkable thing is how quickly some Indonesians reverted to an exaggerated sense of victimhood. The ease with which Australians were reduced to unflattering stereotypes shows a worrying tendency to perceive Australia in the mould of a former colonial power. One article , published in the Jakarta Post, claimed that Australia’s spying made it appear ‘unrefined, unreflective, emotionally unstable and malevolent’. Perspective is the first casualty of a crisis. The question is what we should do about this in the future. Hugh White offered  the view that the diplomatic spat resulted from a belief within the Abbott Government ‘that Australia can dictate the terms of the Australia–Indonesia relationship to suit domestic political agendas and interests without taking account of Indonesia’s agendas and interests’. He says that Australian attitudes, built as they are on ‘old-world assumptions’, will see the Australian government stumble into crises with ever greater frequency in the Asian Century. In this view, Australia needs an attitude adjustment. This is an interesting analysis, but it isn’t exactly clear what Australia’s ‘old-world assumptions’ are, or how they led us astray in this case. Australia’s spying on Indonesia is rooted precisely in the belief that Indonesia is a consequential country and that the views of its leaders matter. Many people now accept that the tone of Abbott’s initial response to the allegations was wrong. Emphasising his refusal to apologise , Abbott gave the impression that his priority was enhancing his domestic image rather than addressing Indonesia’s legitimate concerns. On some level, outdated assumptions about the world may have informed a view that this could be done at an acceptable cost. But beyond atmospherics, it’s not clear what role old-world assumptions might have played, or what the Abbott government should have done differently. Abbott was faced with two contradictory imperatives. To rescue his ‘more-Jakarta-less-Geneva’ foreign policy he needed to make some act of contrition and assure the Indonesians that Australian intelligence agencies were not used to undermine Indonesia. On the other hand he needed to observe the time-honoured Australian diplomatic convention of not commenting on intelligence matters. National politicians from Bob Carr  to Bob Katter  went on record calling for a public apology and an Obama–Merkel style assurance  that this wouldn’t happen again. But in those tense days—that ‘Team Australia moment’—Abbott (for the most part ) refused to publicly comment on intelligence matters. Despite the damage it did, upholding this convention was the right approach. Conventions play an important role in international relations. Not only do they manage expectations among states, but they act as a guide for action in uncertain times. Conventions reflect the wisdom of historical experience and transcend short-sighted political calculations. While there were consequences for not publicly apologising to Indonesia, there would also have been consequences for publicly acknowledging intelligence operations and apologising for injury caused. With Edward Snowden sitting on a cache of potentially sensitive diplomatic cables, caving in this case may well have led to even greater problems down the track. If we apologise to Indonesia would we apologise for spying on China? In that case would we really be sorry? Moreover, as Jennifer Lind recently argued , international apologies are not generally helpful because they can provoke unpredictable reactions within the apologising state. This is why acknowledging harm caused, but not apologising for wrong-doing, is a fairly widely observed convention. Conventions may be inflexible, but they have a way of keeping the devil you don’t know at bay. As Indonesia continues its remarkable transformation into a regional great power it will increasingly become more important to Australia than Australia is to Indonesia. But that doesn’t mean that maintaining good relations should be solely Australia’s responsibility. Maybe old assumptions about Australia’s place in the world are being steadily discredited by Asia’s rise. But the shift to greater uncertainty in Australia’s regional environment that this entails should reinforce, and not reduce, the value of time-tested diplomatic conventions. Daniel Grant is an intern at ASPI. 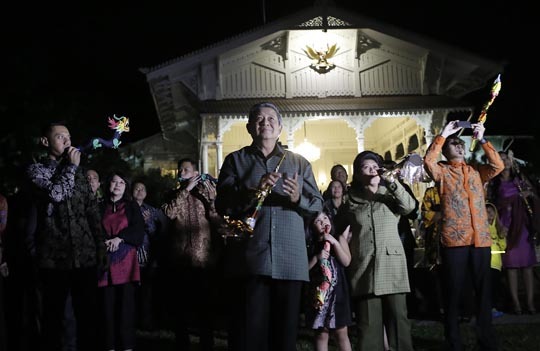 Image courtesy of the official website of the President of the Republic of Indonesia .